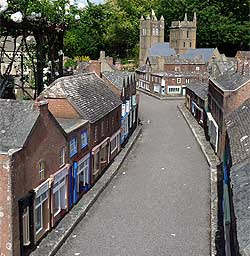 Cycling in Dorset the other day I popped in to Wimborne's Model Town. This is one of those 'world famous' attractions that has the term 'world famous' in quotes, which means you'd vaguely heard of it from an uncle when you were little, or from that primary school teacher from Poole you failed to chat up once. 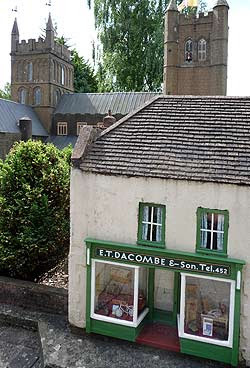 The Model Town, opened in 1951, is a charming one-tenth size reconstruction of Wimborne as it was then, shops, houses, minster and all. You stride around the traffic-free streets, sixty feet tall, like a benign B-movie monster in search of a cycle shop. 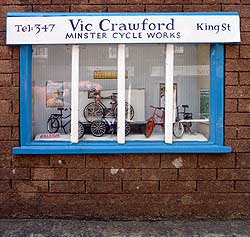 There are two, both with miniature (but rather modern-looking MTB-style) bikes in their windows. Crawford's (tel. 347) looks the place to buy a decent new bike for a few guineas, while Dacombe's (tel. 452) seems the place for repairs and advice, or buying an inner tube for a 2.7 inch wheel. Not much sign of bike parking in 1940s Wimborne by the looks of it, though. Afterwards you can cycle round the full-size modern-day town, to see if the shops are still there (they're not). It's a pleasant enough place, but when you get cut up by a white van you wish you were sixty feet tall again. I've been trying to get in touch regarding a significant cycling event we're running this Friday. Please email me on michaelsamy22 *at* yahoo.co.uk as soon as possible! Thanks. Wimborne seems like a nice place to cycle.It looks pleasant place with traffic free roads. Thanks for the blog!!!! A good post. Good place for cycling .